Today, there is an increasing demand for the removal of tattoos. On average, one in two people wishes to remove their tattoos after about ten years. This is a result of the inevitable changes in fashion and style or simply due to growing older. 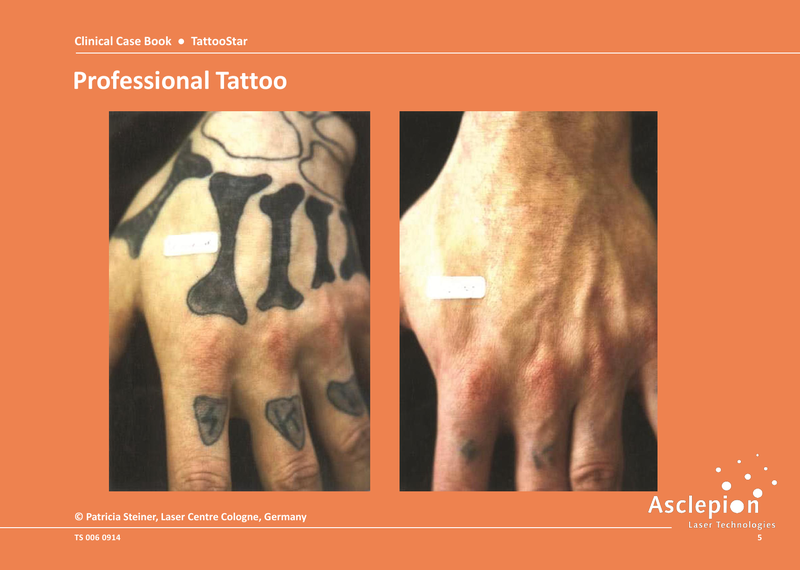 For many years, Nano lasers from Asclepion with various wavelengths have been used to remove tattoos. Compared to other methods, this treatment has the benefit of the risk of scar formation being very low. 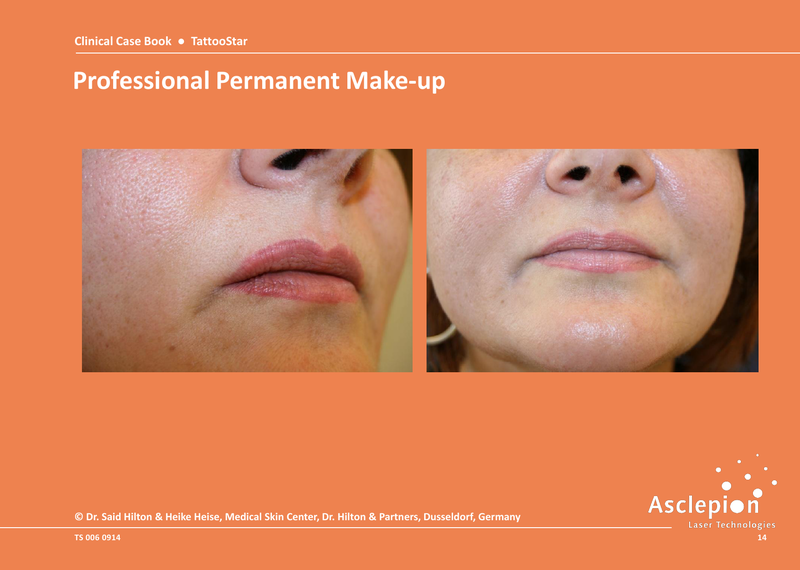 In recent years the Nano lasers have begun to be used for the removal of permanent makeup (special tattoo) as well. Now there is the more modern Pico technology for the same treatments. The type of laser is a decisive factor when determining which color pigments may be treated particularly well and which colors do not respond as well to treatment. Ruby lasers (694 nm) have proved themselves to be almost universally deployable in practice. This wavelength is strongly absorbed by green colored pigments, in addition to dark colors in general. 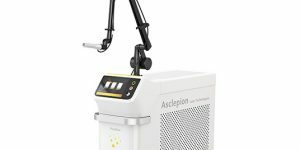 Moreover, as a result of the strong absorption of the ruby laser beam by the skin pigment melanin, these devices are also used for the treatment of natural pigmented lesions. Patients generally tolerate the treatment without an anesthetic; a local anesthetic is only used in rare cases. The light of the Nd:YAG laser (532; 1064 nm) is very well absorbed by red, blue and dark colors in general. 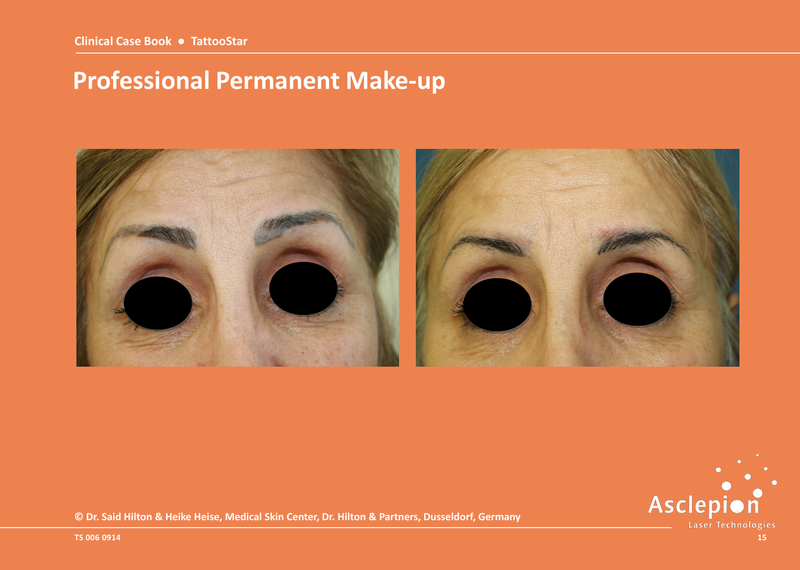 The laser can also be used for the removal of benign pigmented lesions. 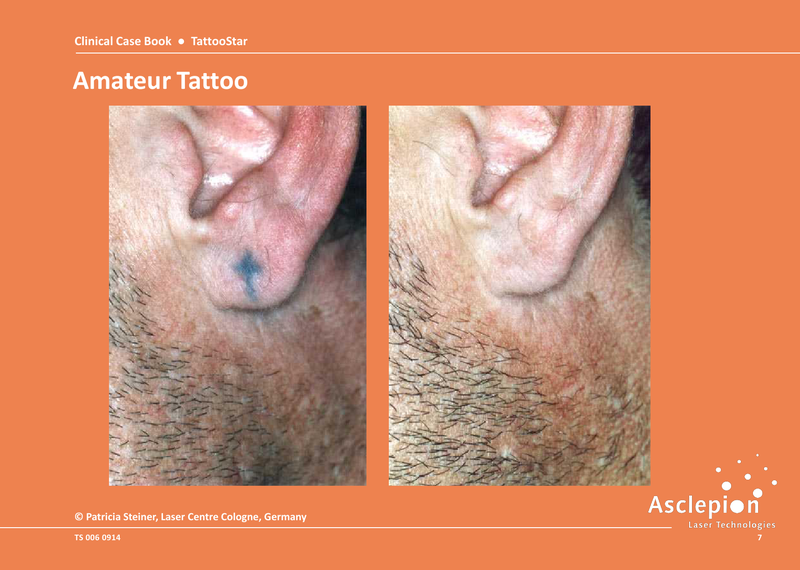 The wavelength of the Ruby or Nd:YAG laser light is specifically absorbed by the color pigments in the tattoo. The energy is transferred and then fragments the ink particles from the connective tissue. The fragmented particles are then degraded epidermally and lymphatically. The irradiated area of skin appears whitish for between ten and twenty minutes immediately after treatment. A slight crust then forms, which will slough off after between one and two weeks. 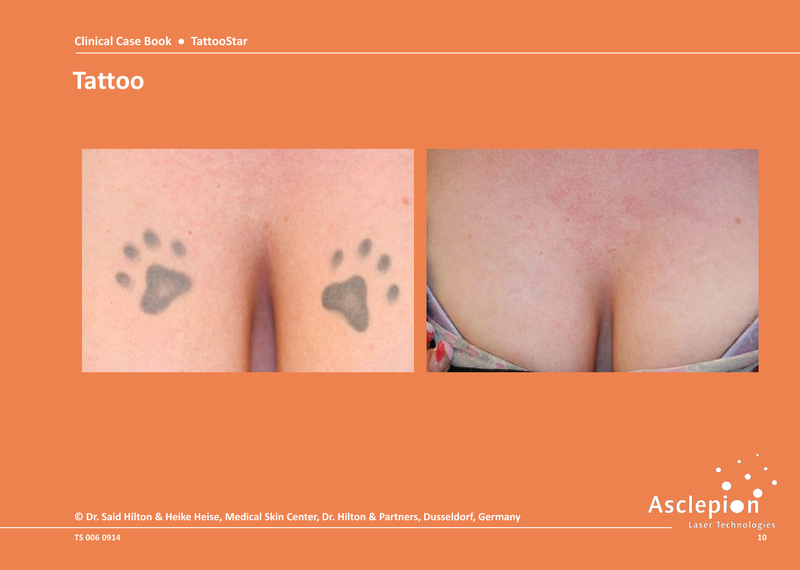 It is common for a number of sessions at intervals of several weeks to be required to remove a tattoo. A tattoo is a mark made by inserting pigments into the skin. 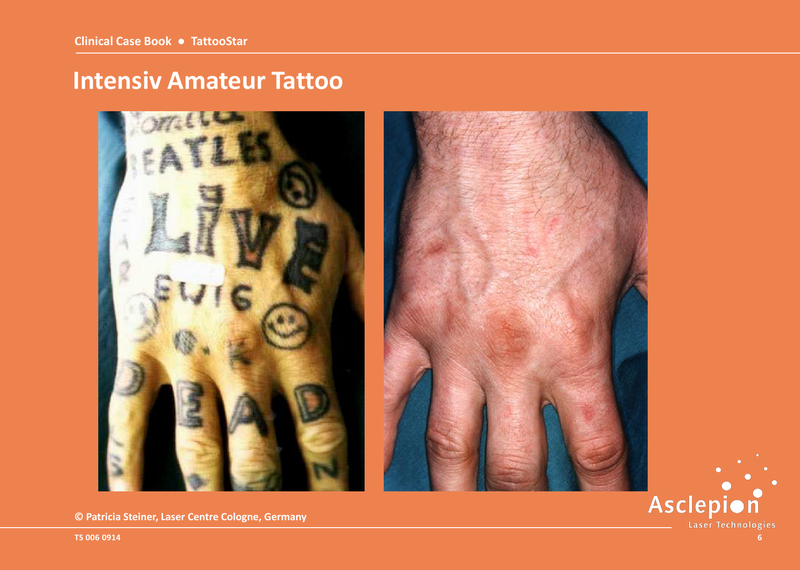 There are also so-called dirt tattoos caused by accidents. What happens when a tattoo is applied? When a tattoo is applied, ink is inserted into the skin. The ink particle reach an area underneath the upper skin layer (epidermis) at a depth of 0.5mm to 2mm. During the healing process, the immune system tries to remove this foreign substance, but since the color pigments are too big to be removed, they are isolated from the surrounding tissue by connective tissue. When an accident occurs, dirt particles may insert into the skin and the body reacts in the same way by building a dirt tattoo. Which tattoo colors can be removed? In general, green and yellow-based ink are the most difficult to remove. Black ink is most readily broken down by the laser. Amateur tattoos are easier to remove than professional tattoos, due to the lower quality and quantity of the ink. How does tattoo removal with lasers work? 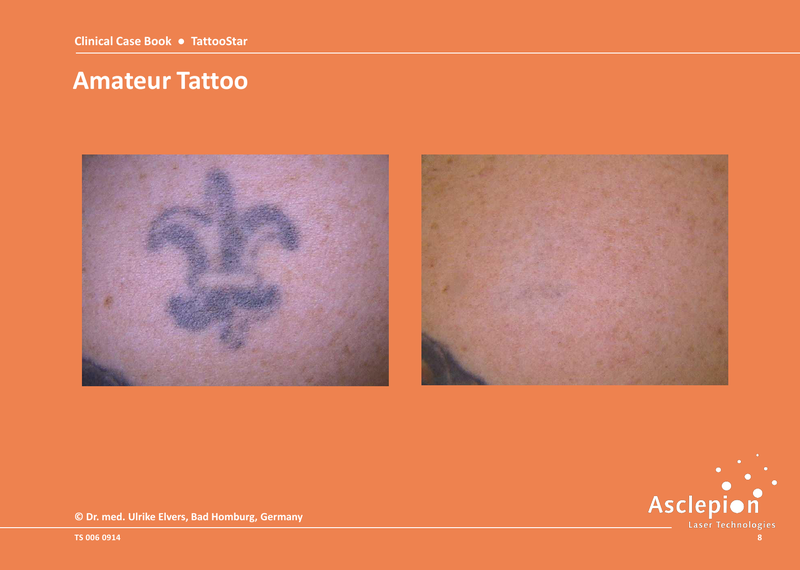 The laser beam penetrates through the upper layer of the skin and is absorbed by the color particles of the tattoo. As the high-energy laser pulses of these devices last only a few nanoseconds, they are absorbed by the pigment particles selectively without causing any coincident thermal damage to the surrounding tissue. The ink particles are fragmented by the laser irradiation and the broken-down ink are removed by the body’s own lymph system. The distance holder of the laser handpiece is placed onto the skin. After the laser is activated via the foot switch, a light impulse is sent, which results in a gentle prickling sensation. The areas to be treated are then moved over with the handpiece of the laser. Immediately following the treatment, the treated area presents the so-called “popcorn effect”, appearing white and displaying blisters. Following the treatment, a redness of the skin, strong sensations of warmth or wheals may occur. After a few hours, the treated areas might darken and a small crust may form. This disappears within a few days. How many sessions are needed to remove a tattoo? 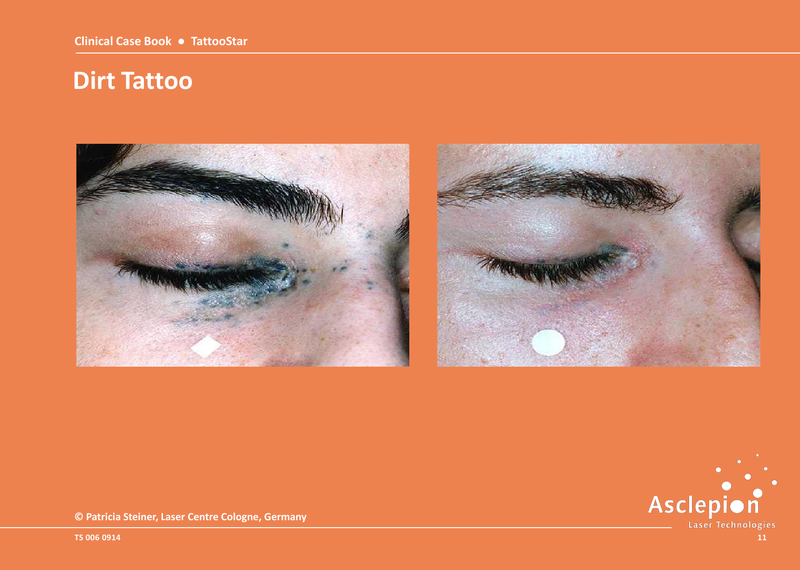 To remove tattoos, a number of treatments are necessary to destroy all ink pigments. The number of treatments depends on the tattoo’s color density, color depth, tone and the size and location of the tattoo. 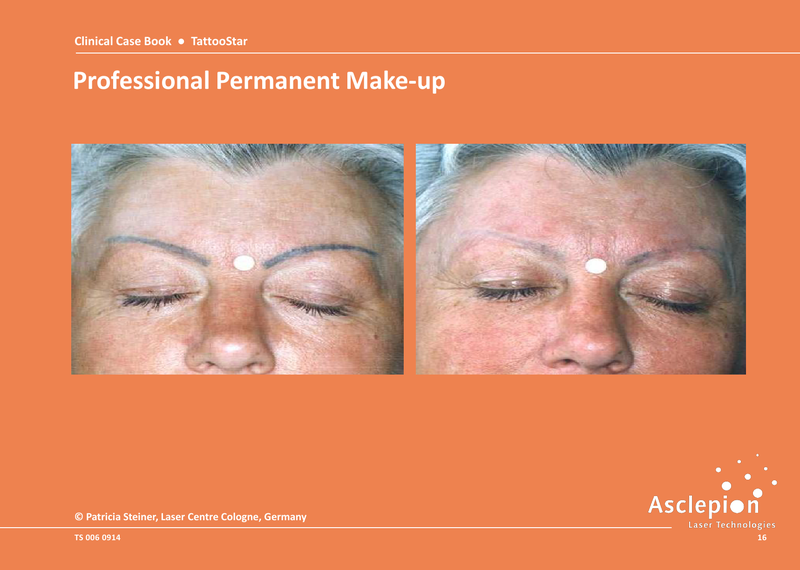 As is the case with permanent makeup, color changes may occur with new tattoos. Please try to provide a color sample to your doctor so the attributes of the color can be tested before treatment. The treatments are performed with an interval of six to eight weeks. No medical treatment is completely risk-free. Normally, laser-treatment is very low-risk. Lightening of the skin or hyper-pigmentation may temporarily occur. In any case, all these effects are reversible and will disappear within a few weeks or months. Neodymium-doped yttrium aluminium garnet (Nd:YAG) 1064-nm picosecond laser vs. Nd:YAG 1064-nm nanosecond laser in tattoo removal: a randomized controlled singleblind clinical trial. Pinto F, Große-Büning S, Karsai S, Weiß C, Bäumler W, Hammes S, Felcht M, Raulin C. Br J Dermatol. 2017 Feb;176(2):457-464. doi: 10.1111/bjd.14962. Epub 2017 Jan 29. Clearance of yellow tattoo ink with a novel 532-nm picosecond laser. Alabdulrazzaq H, Brauer JA, Bae YS, Geronemus RG. Lasers Surg Med. 2015 Apr;47(4):285-8. doi: 10.1002/lsm.22354. 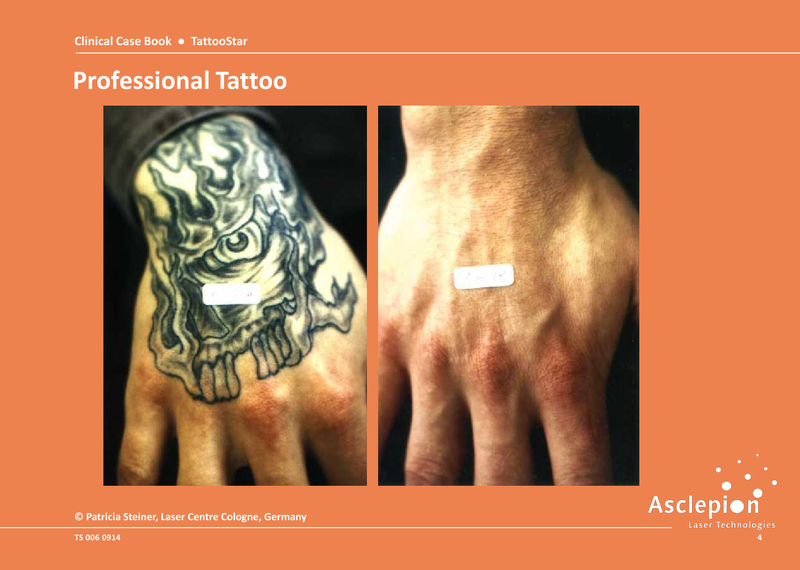 Comparison of responses of tattoos to picosecond and nanosecond Q-switched neodymium: YAG lasers. Ross V, Naseef G, Lin G, Kelly M, Michaud N, Flotte TJ, Raythen J, Anderson RR. Arch Dermatol. 1998 Feb;134(2):167-71. 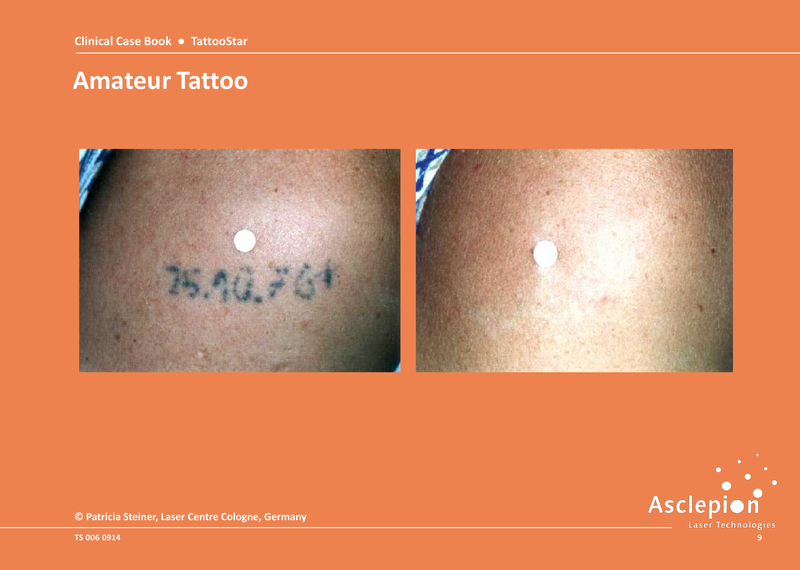 Red ink tattoo reactions: successful treatment with the Q-switched 532 nm Nd:YAG laser. Antony FC, Harland CC. : Br J Dermatol. 2003 Jul;149(1):94-8. Comparison of the Q-switched alexandrite, Nd:YAG, and ruby lasers in treating blue-black tattoos. Leuenberger ML, Mulas MW, Hata TR, Goldman MP, Fitzpatrick RE, Grevelink JM. Dermatol Surg. 1999 Jan;25(1):10-4. Levine VJ, Geronemus RG. : 1995 May;55(5):291-6.